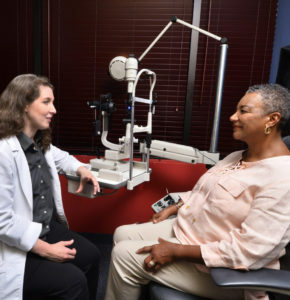 “We should all be so lucky to develop cataracts in our lifetime, as this would mean we have lived a long and healthy life,” says board certified ophthalmologist Samuel Boles, M.D., Medical Director of the Anne Arundel Eye Center. While cataracts are nothing to worry about, they can begin to affect your daily life – and vision changes may become more noticeable during the winter months. Why Are Cataracts More Noticeable in the Winter? And What Should You Do? When cataracts begin to affect your daily life, Dr. Turner recommends seeing your primary eye care provider for a comprehensive exam. “Sometimes changes in vision can be corrected with a change in glasses prescription,” she says. However, this may not always be the case. Eventually, vision changes due to cataracts may not be adequately corrected with a change in glasses prescription. When this occurs, your optometrist will likely make a referral to a cataract specialist for evaluation to determine if surgery is the right option. Cataract surgery involves removing the lens of the eye and replacing it with an artificial lens – an intraocular lense (IOL) implant. Under local anesthesia, a small incision is made on the edge of the cornea and high frequency ultrasound vibrations gently dissolve the natural lens into small pieces. These fragments are removed and replaced with the IOL. The simple answer is no. “Unfortunately, cataracts are an unavoidable aging change of the lens within the eye,” says Dr. Turner. These changes are unpredictable and occur at different rates and at different times in each person. However, “changes can be slowed down by protecting the eyes from excessive sun exposure,” adds Dr. Turner. UV blocking sunglasses are your best defense, even in the winter months. Still, the absolutely best way to protect your vision and manage any changes in your eyesight is with regular trips to your eye doctor. Dr. Boles offers the LenSx® Laser, the most technologically advanced option for cataract patients today, to create a cataract surgery that’s 100% unique to each patient. If you have any questions, please contact Dr. Samuel Boles, Dr. Nicole Kershner Regis, Dr. Kathryn Gurganus Turner, and the eye care specialists here at AAEC by calling 410-224-2010. AAEC is staffed by caring and knowledgeable professionals who will help guide you on your healing journey.